At Billings Lawn Equipment, our goal is to provide the best sales and service to the commercial landscaper as well as provide our professional knowledge to the homeowner. 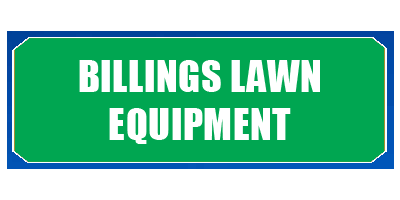 Billings has been in the lawn equipment business for over forty years. Billings started in the 1940′s as a small feed store in downtown Royal Oak, selling everything from chicken scratch to dog food, even hay for the horses. In the 1950′s we decided to tackle a new beast and take on lawn equipment.We started out strictly selling mowers for the residential customer, but quickly started handling commercial equipment like Bobcat and Locke. In 2001 we relocated to our present facility as we transitioned the feed business out of our inventory and focused all of our time into the power equipment industry. We are factory trained in every piece of equipment we sell and service, and are more than happy to help with any questions you may have. We are now an EXPERT dealer for KOHLER and KAWASAKI as well as a master dealer for Briggs and Stratton, Tecumseh and Diahatsu. This means certification tests have been taken and passed. The staff is trained in all areas of our business to help make your experience with us memorable. We have made it easy to contact us via e-mail, phone (248)541-0138, or fax (248)541-0601. Check out the rest of our site to see the many brands we sell and service. CLICK HERE to see what else you can do in downtown Royal Oak while visiting us at Billings. We carry the following brands: Toro, Honda ,Husqvarna,Ferris, Shindiawa, Red Max, Echo,Worx, Kawasaki, Snapper Pro, Snapper, Poulan, Mantis, Little Wonder, Billy Goat, DR. We are proud to cover the following areas of Southeast Michigan: Royal Oak, Birmingham, Northville, Novi, Livonia, Walled Lake, South Lyon, Wixom, Milford, Madison Heights, Roseville, Berkley, Warren, Ferndale, Oak Park, Southfield, Franklin, Bingham Farms, Bloomfield Hills, West Bloomfield, Farmington, Farmington Hills, Rochester Hills, Sterling Heights, Rochester, Clawson.